Intel Core i7 3820 / X79 Platform - How much Memory is Ideal? Abstract: While setting up Gigabyte's latest Intel X79 motherboard on the PCSTATS test bench a few week ago, we found ourselves wondering; "what's the ideal amount of memory to use in a Intel Core i7 3820 'Sandy Bridge-E' platform these days?" Obviously, with a 32-bit Windows 7 OS we'd be limited to 4GB of system memory, but what's the magic number for Windows 7 64-bit? While setting up Gigabyte's latest Intel X79 motherboard on the PCSTATS test bench a few week ago, we found ourselves wondering; "what's the ideal amount of memory to use in a Intel Core i7 3820 'Sandy Bridge-E' platform these days?" Obviously, with a 32-bit Windows 7 OS we'd be limited to 4GB of system memory, but what's the magic number for Windows 7 64-bit? 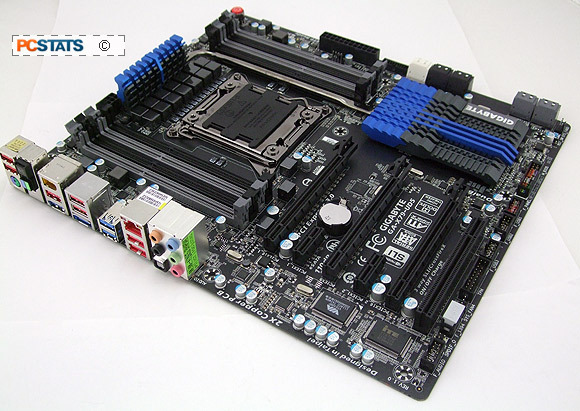 The mobo in question was a GA-X79-UD5, the one model from Gigabyte's X79 stables capable of supporting 64GB of memory thanks to eight DDR3 RAM slots. At a cost of nearly $600 to populate those eight DIMMs though... we suspect few users will embark on this path until the price of 8GB DDR3 modules comes down some. As Intel's 'Sandy Bridge-E' processor operates with a quad-channel memory controller, whatever amount of system memory we choose is going to be installed in multiples of four. 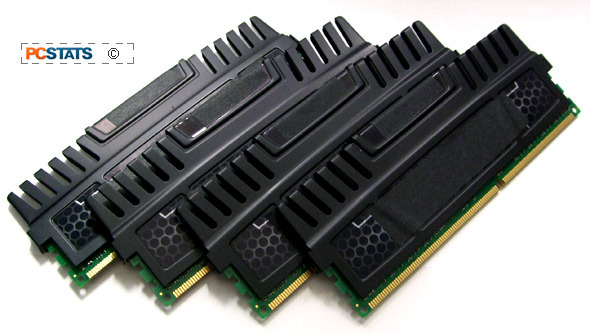 After scouring the local computer joints and price checking a few online RAM retailers like Crucial, Kingston and Corsair, four options presented themselves; A) 8x 8GB = 64GB DDR3 at a cost of roughly $590, B) 4x 8GB = 32GB DDR3 at ~$280, C) 4x 4GB = 16GB at about $110-$125 and D) 4x 2GB = 8GB for $50 bucks. Option A) 64GB / $600 is too expensive for this economy, but more importantly we had to ask ourselves if 64GB of system memory would make a justifiable impact in the current motherboard and CPU benchmark sets? Without a clear answer on the application front, one way or the other, spending $600 bucks on RAM is a bad gamble. Option D) 8GB / $50 is exceptionally economical, however while it's cheap to implement up front, in the long run locking down four DIMM slots to low density 2GB modules means you'll have to replace everything with higher density memory at some point. If your PC budget is super limited, you'd be better off installing 2x 4GB memory modules instead. The cost is the same, the key difference is that 4GB modules are a good density while 2GB DDR3 modules aren't in the long term. What's better, 16GB of DDR3 or 4GB DDR3? PCSTATS could have gone with Option B) 32GB / $280 or Option C) 16GB / $110 - either would be a good choice. However, while the former is better in the long term (higher density modules = easier RAM upgrades), the latter was in budget. With that sorted, let's begin. 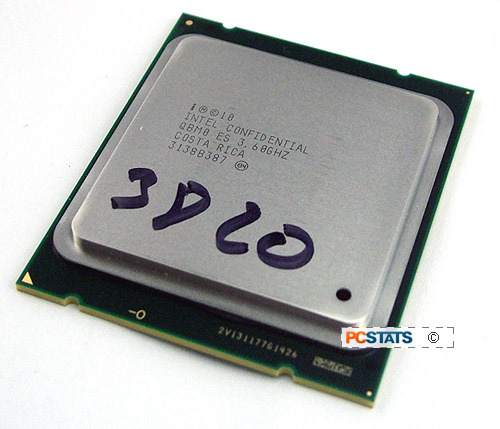 In this brief article PCSTATS will compare an Intel X79 / Core i7 3820 Sandy Bridge-E platform installed with Windows 7 32-bit and 4GB of system memory against the same platform installed with Microsoft Windows 7 x64 running on 16GB DDR3. We want to know how memory capacity and OS choice impact the current motherboard and CPU benchmark sets, in part to determine if the cost of higher density DDR3 modules is justified. Since the hardware will remain identical between the two tests, we won't bother with a detailed test system spec chart. Each system was comprised of an Intel Core i7 3820 CPU, Gigabyte GA-X79-UD5 motherboard, 4x4GB of DDR3-1600-C9 memory, nVidia GTX-470 VGA and 120GB OCZ Vertex 2 SATA II SSD. Explanations after the benchmark chart. Results in bold are best for each particular benchmark test. Looking over these comparative results a couple points become obvious. First, on the whole the Windows 7 x64 / 16GB system configuration does achieve the majority of better benchmark results. However, among the 'Gaming,' 'CPU-computational and Rendering' oriented benchmarks the two systems return essentially the same results. These tests include Bibble, Sciencemark, SuperPi, WPrime, PovRay, 3DMark06, 3DMark Vantage and FEAR. Within the group of 'System Level' benchmarks, Sysmark 2007 sees on average a 2% improvement in favour of the Win7 x64/16GB PC configuration. Conversely, PCMark Vantage (another 32-bit application) performs about 11% worse on the Win7 x64/16GB configuration. The most dramatic difference between Windows 7 x32 / 4GB and Windows 7 x64 / 16GB platforms comes via Cinebench R10 where x32-bit and x64-bit versions of the benchmark compete in their respective native environments. Cinebench R10 x64 posts a healthy 19% gain which just goes to underscore the potential benefit of native x64 software applications running under a x64-bit OS. Curiously, Cinebench R11.5 sees much less of a change between systems. Benchmarks like Sandra's multi-media float x2 and x4 testa witnessed a healthy 21% improvement on the Windows 7 x64 / 16GB platform. On the whole, Windows 7 x64 is well suited to the Intel Core i7 Sandy Bridge-E architecture. If many of your daily work programs are still 32-bit applications, there's no real penalty to emulating that 32-bit software in a 64-bit OS environment. When native 64-bit applications are run, a nice performance benefit is seen. Furthermore, with the quad-channel high memory capacity available to Sandy Bridge-E processors, a 64-bit Operating System is mandatory. On the question of how much memory... the results are open to interpretation based on the programs you yourself use. Looking at the results for PCSTATS' standard CPU and Mobo benchmark set, it's clear these applications see little real world performance gain from 16GB of RAM. At a certain point the operating system has enough system memory and then it all comes down to the applications. Spending extra cash on 32GB or 64GB worth of memory isn't necessary, in our case. The caveat of course, is that some programs and games thrive on RAM, so this isn't a one-size-fits-all-statement. Know your applications, know how much memory you need to run Adobe Photoshop, or CAD, or whatever and size your system memory to meet those needs. We may not need 16GB of RAM now, but a year down the road, if the PC requires 32GB of RAM at least the upgrade path is going to be easy. Not quite the result we expected, but there ya go. Find out about this and many other reviews by joining the Weekly PCSTATS Newsletter today! Catch all of PCSTATS latest reviews right here.